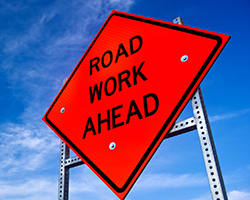 Southbound traffic on Rufe Snow Drive will be transitioned to the new pavement on Tuesday, March 5, 2019 from Ridgetop Road to Mid Cities Boulevard. Please slow down and pay attention to all construction signs and barricades. Following the traffic switch, work will begin on Phase 3 which consists of installing the remaining storm drain pipes, making final water line adjustments, paving the 3 interior lanes, completing sidewalks and installing the permanent traffic signals at all three intersections. Phase II subgrade stabilization and asphalt placement is complete and concrete paving has begun on the two new south bound travel lanes along with sidewalk. Once this work is complete southbound traffic will be shifted to the new pavement and the contractor will proceed to the third and final phase of the project which consists of paving the middle of the roadway. The project is a 3 phase project, and the contractor is in the 3rd phase. Phase 1 consisted of water line relocation, storm drain installation and constructing the two outside northbound lanes on the east side of the roadway. Phase 2 consists of paving the 2 southbound outside lanes on the west side of the roadway and finishing up storm drains. Phase 3 consists of paving the 3 interior lanes and installing the permanent traffic signals at all three intersections. The City of North Richland Hills is currently pursuing all contractual and legal options available to get this project completed. The contractor is paid after work is completed, inspected and invoiced. To date, the contractor has been paid $7.5 million of the $12.1 million contract. Because this project was funded through Federal Grants, TXDOT was assigned the task of ensuring that the bidding process, design and construction is compliant with Federal Standards. Federal standards are stringent and require several steps to be followed throughout the bidding, design and construction process. The project was advertised for bid in November 2015, and bids were opened on December 18, 2015. Three bids were received ranging in price from $12,134,407 to $13,709,537. The lowest responsive qualified bidder was selected. Before a bidder is determined to be qualified, they are pre-qualified by TxDOT through evaluation of their financial health, construction capability, and bonding capacity. The bid evaluation process included discussions between city staff and TxDOT personnel. The lowest responsive qualified bidder was presented to the City Council for approval. Additional questions may be directed to the Public Works Department at 817-427-6400.